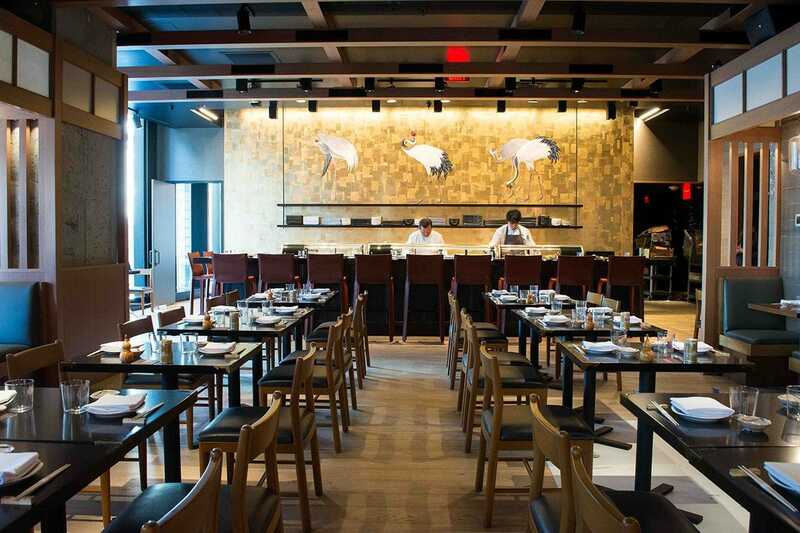 Boston’s outpost is a chic, sophisticated sibling to the popular San Francisco izakaya and sushi bar led by James Beard Award-winning restaurateur Michael Mina and partner and sushi chef Ken Tominaga. 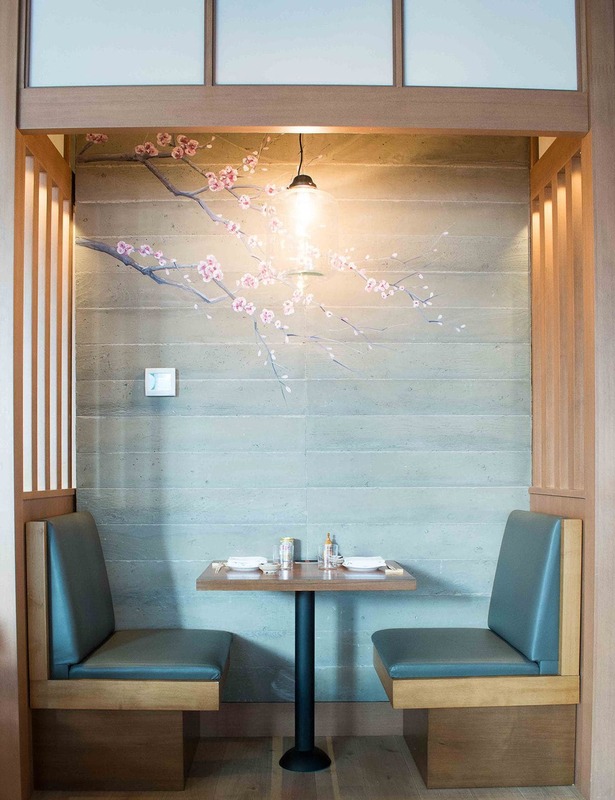 Los Angeles-based firm Bishop Pass, which also led the design of the California restaurant, created visual homages to classic Japanese traditions. The ground-floor foyer has an abstract, bronze sugidama—a cedar bough used in sake-making—as well as oversized brewing vessels, and the sake-making theme continues with decorative drums and backlit bottles at the top of the elevator in a waiting area. 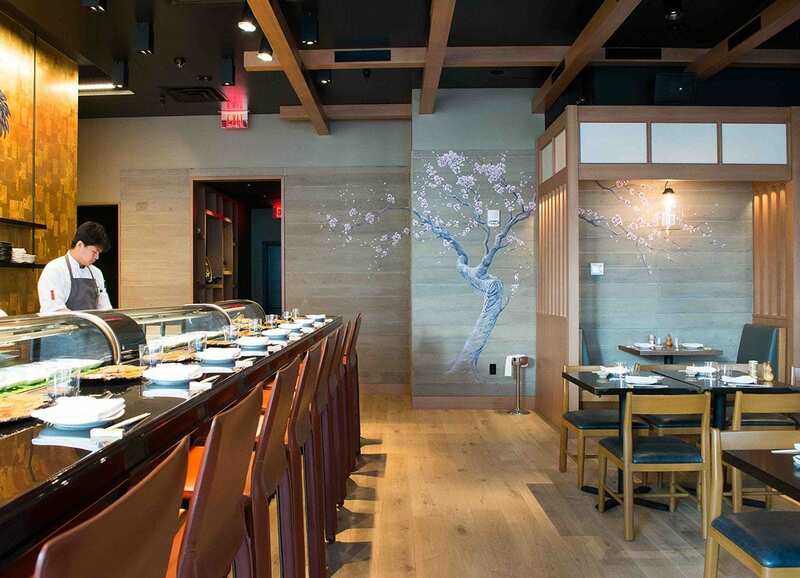 The 72-seat sake bar and lounge area is wallpapered in artistically rendered, recycled newspaper, and dozens of white light fixtures recall Japanese paper lanterns. In the 64-seat dining room, light Douglas fir comprises the booths, and glossy, black surfaces on the tabletops and 15-seat sushi bar is inspired by Japanese lacquerware. There’s also a 20-seat private dining room. Hand-painted cherry blossoms and golden cranes are the work of Morgan Bricca. The whole, second-floor restaurant overlooks Downtown Crossing shops from floor-to-ceiling windows. “It’s very much a journey through the restaurant,” says Pabu Boston general manager Linchul Shin. That begins in the lively bar, with seasonal cocktails, a venerable sake list curated by sake sommelier Mayuka Yatomi, and an unparalleled Japanese whiskey program by beverage director Daniel Grajewski. Yatomi is bringing in more than 75 sakes, including imported bottles that haven’t previously made it to Boston. Grajewski’s shelves have 22 different Japanese whiskeys, and he’s working with specialty collectors and distributors to add a dozen more, including a 30-plus-year-old vintage from the legendary Karuziawa distillery, he says. Pabu Boston’s Japanese whiskey list is poised to be the country’s largest, rivaling its San Francisco sibling’s, Grajewski says. Tominaga is on hand for the opening, but the Boston kitchen is led by executive chef Ben Steigers. The lengthy menu offers a variety of dining experiences, from casual, social meals comprised of cold and hot small plates, robatayaki (grilled) skewers, sushi and nigiri, a multi-course omakase tasting menu, and entrées, like miso black cod, Roasted Fallon Ranch chicken with hedgehog mushrooms, Okinawa potatoes, shishito peppers; and an expanded steak program. Pabu Boston has three different Wagyu cuts and three Angus steaks available, with Japanese-inspired sides like sansho pepper au poivre, Steigers says. There’s also a tableside shabu-shabu option. “It’s a far cry from the purple sea urchin you find in California,” says Steigers, who was previously sous chef at Pabu SF. The lobes are more delicate and sweeter, he says. Tominaga is thrilled to work with Atlantic surf clams, as well as little necks, oysters, lobster, black cod, bluefin tuna, and more. “Even in Japan, Boston is well-known for its tuna,” Steigers says. Pabu opens for dinner on Tuesday, November 1, with lunch rolling out in the coming weeks. Pabu Boston at Millennium Tower, 3 Franklin St., Boston, 857-327-7228, www.michaelmina.net.